Plane Finder AR adds a layer of augmented reality to its previous (and free) Plane Finder app, now charging $3 for the privilege of seeing the flight number, speed, destination and other such details of overhead planes. The same developer is making a name for itself in transportation apps, with its Airline Finder acting as a guide to all the various airline planes in the world; Ship Finder showing real-time movements of our aquatic vessels; and the real-time Plane Finder and Plane Finder Free apps, which only has $5 and detailed aircraft information on each plane between them. 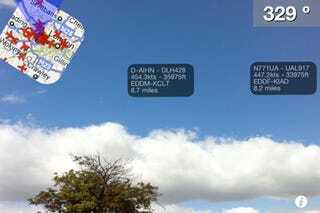 This latest one, Plane Finder AR, displays augmented reality information on the iPhone 3GS and iPhone 4's screens, when pointed at a plane in the sky. Little thumbnails appear, highlighting the flight number, speed, altitude, last port of call and destination, and how far away it is from you.